Shrewsbury Town captain Nat Knight-Percival has called for fans to get behind the team ahead of Saturday's game at League One leaders Burton. Micky Mellon's side have conceded 10 goals in two league games so far in January, to slip to 21st in the table. "All the lads are sticking together. There is no-one who is going off plan from what we are doing," Knight-Percival told BBC Radio Shropshire. "Hopefully the fans will support us because it is always much needed." Shrewsbury have managed to win just two of their last 11 league games. In contrast, Burton, promoted as League Two champions ahead of Shrewsbury in April, have picked up 22 points from the last 24 available. Yet, despite the contrasting fortunes of the two teams, Knight-Percival insists that no game in the league is unwinnable. "From the outside it will seem like we are underdogs but sometimes that can work in your favour," he said. "It is just a case of us doing our preparation and then going into the game with our minds focused on winning. We're confident that we can do that, in this league any team can beat any other team." Although they lost 3-0 at home to Mellon's old club Barnsley last weekend, Shrewsbury did upset the formbook a week earlier by knocking Championship side Cardiff City out of the FA Cup. They also have three more of their five January signings to bring in for their first start. 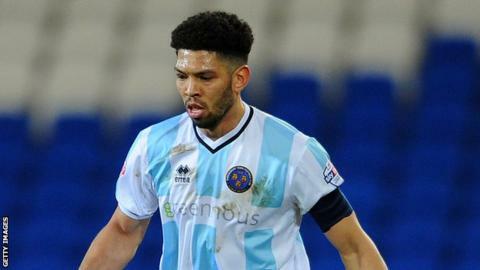 Midfielders Ritchie Wellens and James Wallace, as well as striker Kyle Vassell, did not appear until the break against Barnsley, by which time the Town were already 2-0 down.